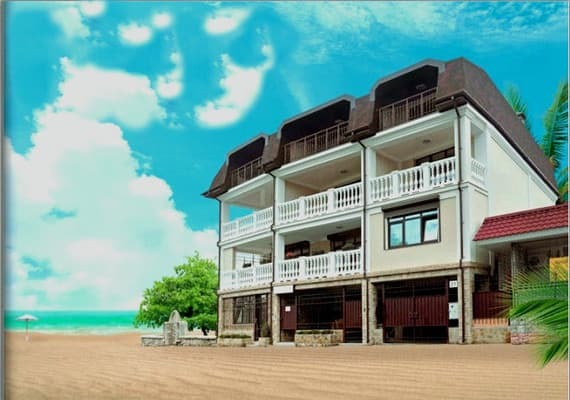 Mini-hotel "Lotos" is located 250 meters from the sea in the historic area of ​​Alushta. The hotel "Lotus" takes guests around the clock and at any time of the year. For the guests cozy rooms are prepared, with original interiors and different class. Each room has all the conditions for a good rest. The balconies offer stunning views of the sea and mountains. It offers free Wi-Fi and on-site parking. The helpful staff will get rid of all domestic problems, fix the order in the room and make the rest truly serene and comfortable. Nearby is the fortress "Aluston", where the episodes of the famous film "The Caucasian Captive" were shot. The city of Alushta itself is located in a fantastic valley, surrounded by the mountain ranges of Castel, Chamny-Burun, Babugan, Chatyrdag and Demerdzhi. PRICES MAY CHANGE, YOU NEED TO RECEIVE INFORMATION FROM THE OPERATOR! 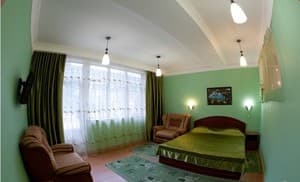 Description of the room: The room is 22 square meters (kitchen area 8 square meters) is a double comfortable bed, two armchair-beds, a set of dishes for 6 people, modern kitchen equipment. 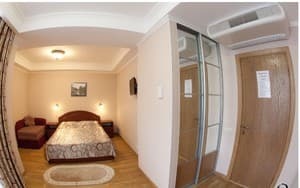 Description of the room: The room has an area of ​​18 square meters. meter, a comfortable double bed, a chair-bed, a necessary set of dishes. From the balcony (5 square meters), where two rattan chairs, a table, a beautiful view of the sea. 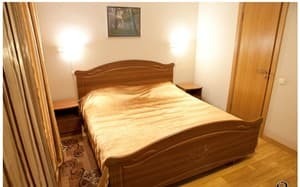 Description of the room: The room has an area of ​​21 square meters. meter, a comfortable double bed, a chair-bed. From the balcony (4 square meters), which has two rattan chairs and a table, offers a wonderful view of the mountains. Description of the room: The room has an area of ​​21 square meters. meter, a comfortable double bed, a chair-bed. From the terrace (7.5 sq. Meters), on which there are two rattan chairs, a table, a chaise longue, you can admire the panorama of the mountains and the sea. Description of the room: The room has an area of ​​18 square meters. meter, a comfortable double bed, a chair-bed. From the terrace (10 square meters), on which are two rattan chairs, a table, two deckchairs, you can admire the panorama of the sea. Located in the heart of the resort infrastructure of Alushta, 20 meters from the tower "Aluston", 300 meters from the railway ticket office of the city of Alushta, 200 meters from the main post office, 1 km. from the bus station. Distance to the sea - 250 m. To Simferopol - 45 km, Yalta - 35 km. GPS: 44.672491,34.412355. From the railway station trolleybus No. 51 to the final Alushta, Embankment. 90 minutes from Simferopol to Alushta. The distance is 300 m from the stop.